Shedding weight often means shedding features. The ability to adjust your ski bindings to various boot lengths is one such feature that is commonly jettisoned on race bindings. If you know you’re going to be using a particular boot for a season or two, why carry an extra ounce or two? But weight isn’t the only reason to go fixed. There is beauty and reliability in simplicity; one less thing to jam, strip, or break. Removing adjustment mechanisms also tends to lower pin heights, which is helpful if you’re targeting a neutral stance. For all the above reasons, we tend to recommend fixed mounts if you have reasonable confidence you’ll be in the same boots for at least a season. We make that recommendation knowing there is a fallback plan. 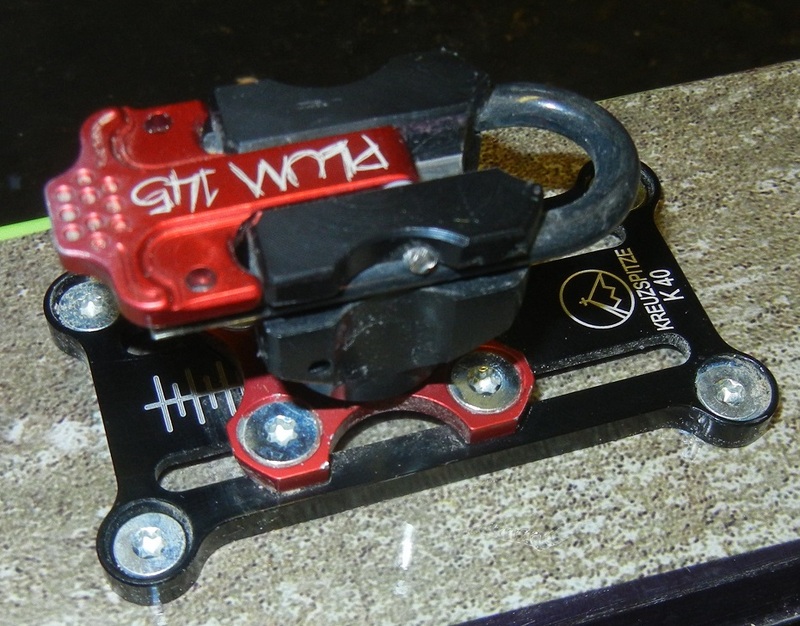 If you do end up changing boots or selling your skis, you can add adjustment plates at that time. 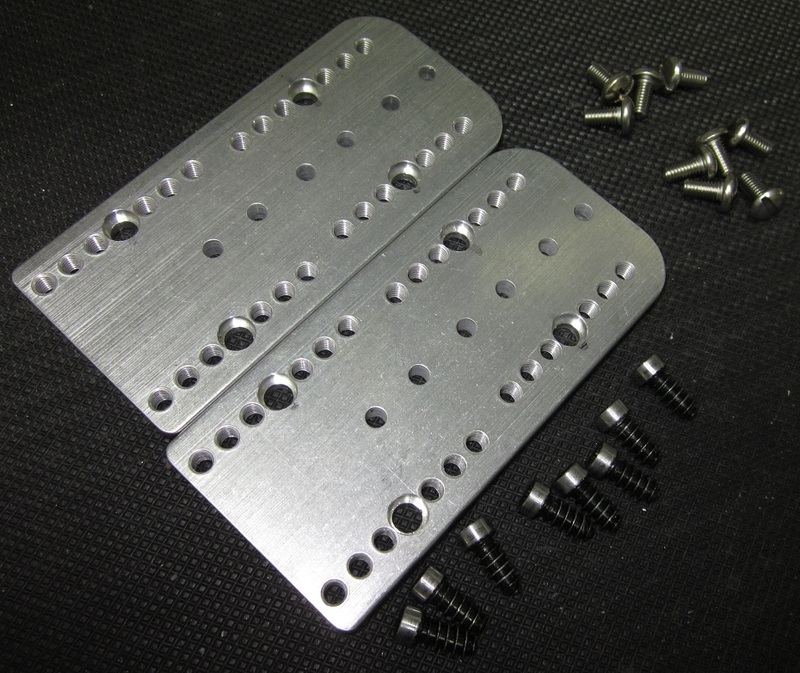 Almost every tech binding can be mounted onto some combination of toe and/or heel plates using special hardware. The plates are then mounted onto your skis, usually with the screws that came with the binding. There are three main types of binding adjustment plates: bolt-tension, bolt-positioning, and threaded-hole. Each is detailed in its own section below. Bolt-tension plates are the most common and consist of simple tracks along which adjustment screws can be slid. Resistance to fore/aft movement is proportional to how tightly the bolts are fastened into nuts mounted underneath the plate. Because of this fact, it’s a natural instinct to want to overtighten the bolts. It’s also tempting to add Loctite or similar thread-locker to prevent the bolts from loosening. However this can lead to stripped screws, for which finding replacements can be difficult. We tend to take the opposite approach and add grease to the threads, making sure to check their tightness on a regular basis. Be careful not to grease the actual plates or nuts underneath, as these surfaces provide the friction that prevents the heels from sliding. The table above details the dimensions of the adjustment tracks and mounting patterns for various adjustment plates. Combined with binding dimensions, you can determine what plates might work with your binding as well as calculate the approximate amount of fore/aft adjustability. Let’s consider an example. The Kreuzspitze adjustment plates feature a 20.5mm wide track, which happens to be the mounting width of the Plum race 135/145 heels. Sure enough, that heel/plate combo works great. This means that you can easily swap a Dynafit touring heel with a Plum race heel without re-drilling. That’s because the 14mm “Special K” adjustment plates are drill hole compatible with Dynafit Speed, Radical, Vertical & Comfort heels. To approximate the adjustment range of that combo, start by subtracting the rail length dimension by the mounting length of the heel piece. From this result, subtract another 5-6mm to account for the screw width (or more precisely, two half-widths). The adjustment bolts need to fit in the tracks, after all. Checking the data tables, the 14mm adjustment plates have a 45mm track and the Plum heel holes are 26mm apart lengthwise. They come with M5 (5mm) bolts. Plugging the numbers into the formula, 45mm – 26mm – 5mm = 14mm. Thus Plum heels have a ~14mm adjustment range when mounted on a Kreuzspitze 14mm plate. We recommend subtracting a couple more millimeters to account for variances in nut shape, hole chamfering, mount location, and discrepancies between stated and measured sole lengths. 12-13mm should be all the adjustment you can expect from this combo. Now let’s try a more advanced example. The Hagan binding plates feature a 25mm wide track, which happens to be the same length as the Kreuzspitze SCTT heel pieces. Knowing the internal binding mechanics are symmetrical, it’s possible to mount the heels sideways on a Hagan plate. While not necessarily a recommended configuration, we were able to use this combo successfully in a pinch. One warning when mixing and matching plates and heels across brands. The mounting screws for one brand may not seat properly in the plate holes of another, reducing the amount of threads engaged in the ski. To be safe, we recommend using the binding mounting screws provided by the manufacturer of the plates, noting that these are not typically included. Bolt-positioning plates consist of a linear stage that slides along a leadscrew, actuated with a wrench or driver. Often called rental plates, these devices are faster to adjust and less likely to strip. They are also easier to fine tune for a precise heel gap (heels mounted on tension plates can subtly wander during tightening). The downside is they tend to be heavier and compatible with fewer heel pieces. This is because the stage is drilled and threaded to accept a specific heel pattern. Below are the nitty-gritty details of said patterns. 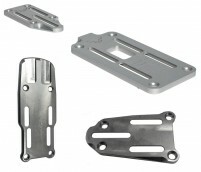 Also known as shift plates, threaded-hole plates consist of multiple sets of holes that exactly match the mounting pattern of the bindings they support. Screw the binding toe or heel into the hole-set that makes the most sense given your boot sole length and desired mounting position. These types of plates are very robust, yet lack the ability to fine tune the binding position since they can only be moved in pre-defined distance increments. Fine-tuning is accomplished with another plate or a binding with a built-in adjustment mechanism. The pre-defined increments are listed below. Threaded-hole plates are often used in situations where drilling additional holes is suboptimal, usually because the new set would be too close to existing holes or otherwise compromise the integrity of the ski. In this case, you can use the existing holes to mount the plates, and then select another hole-set into which you can screw the binding. Thus you’ve effectively shifted the location of the existing mount. All of the above plate types can be useful when maintaining a boot quiver as they can help you maintain a centered position on the ski. They are also handy if you aren’t quite sure where you want to be mounted on the ski. 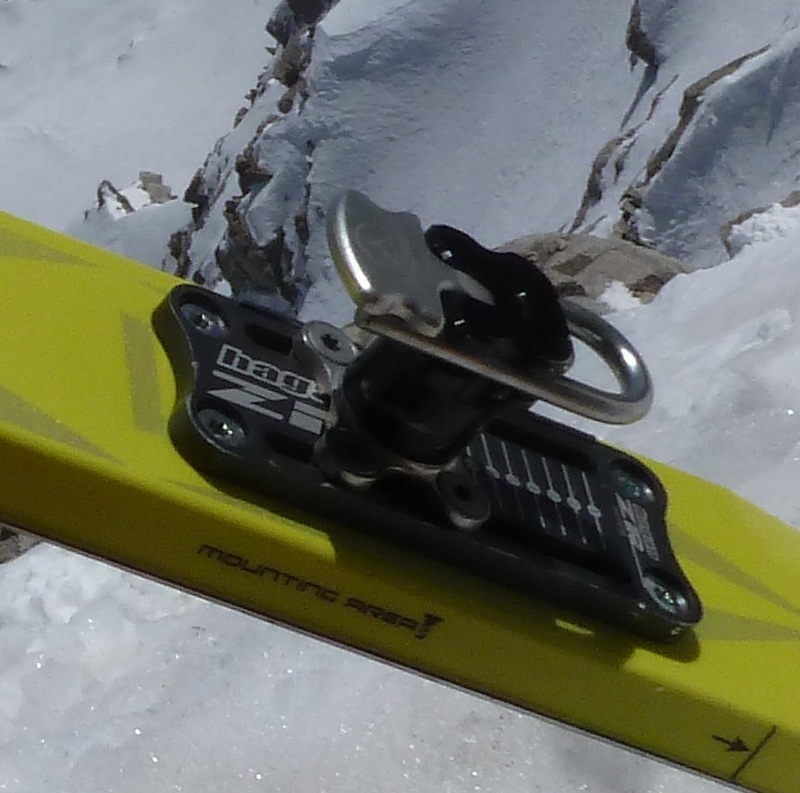 One use-case is to mount a ski with some adjustment plates and test skiing it at various fore/aft positions. Once the sweet spot is found, you can then remove the plates and do a fixed mount at the perfect location for your style and boot sole length. That’s all for now. We hope you’ve found this information helpful. Head on over to our binding section to acquire these tools of the trade. I bought the Kreuzspitze K14 plate, removed my old Speed Turn heels and, reusing the same holes, switched to the Kreuzspitze SCTT heels to create a perfect setup! Lost a lot of weight and ramp. I am slowing going through the quiver and installing inserts for all my Dynafit heel bindings so I can switch between the Kreuzspitze and Dynafit heels depending on the mission. 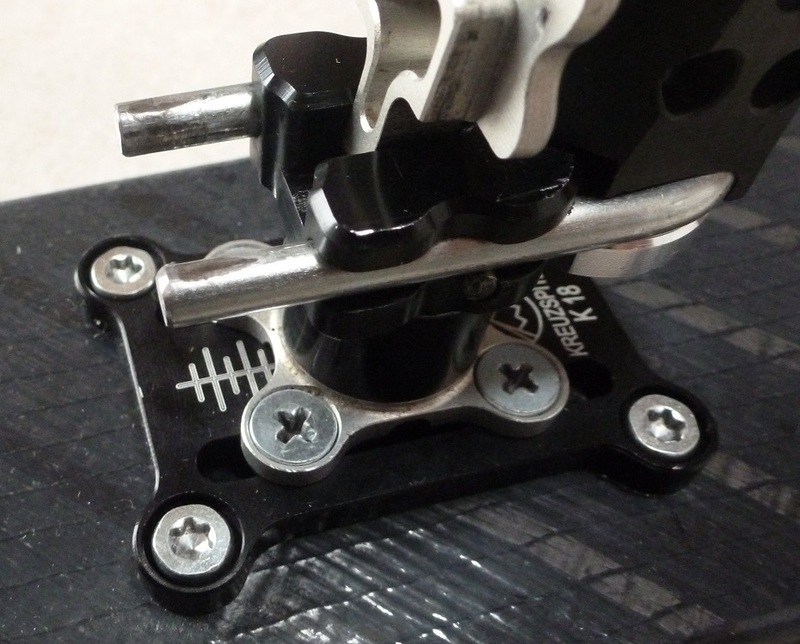 Regarding ramp, the plate allowed me to drop the delta from +15.5mm for the Speed Turn to +5.0mm for Kreuzspitze plate and SCTT heel - which seems perfect to me. 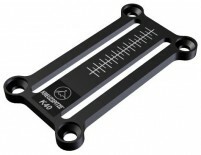 Without the plate, the SCTT heel mounted directly to the ski would have a delta of -0.5mm which I assume would feel too low for most used to the 15mm-ish deltas. I wish I read this article earlier because I over-tightened the screws holding the heel to the plate and quickly stripped the screws. Although grease may have helped, I blame the extreme el-cheapo screws that come with the Kreuzspitze plate. Cheap/soft Phillips screws should not have been included with the extremely well made Kreuzspitze stuff. Just looking at the Phillips screw that is most well-lit in the last photo in this article and I can see how the bit has slipped and rounded the soft metal a little already. I recommend replacing the stock screws with better/harder screws with a different head right out of the box. I went with M5 hex heads from Tacoma screw. Love, love, love the articles - keep 'em coming! Hi Doug, thanks for the feedback. 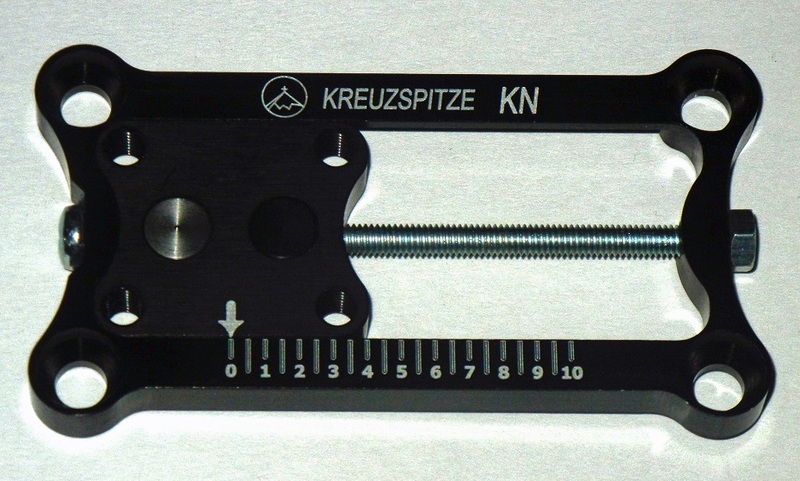 FYI, Kreuzspitze realized their screws were sub-optimal and have now started shipping the plates with much stronger Torx screws. I'm happy to send you a set. 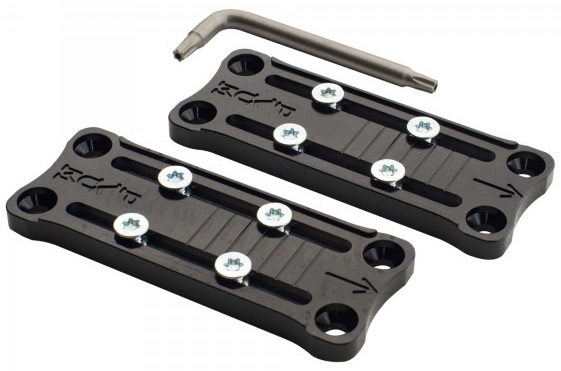 I'm looking for a mounting plate that will let me use the Speed Turn 1.0 Heel insert holes with my Fischer Tour Race 1.0 heel (aka the Hagan ZR heel). I've been googling around and I can't seem to find such a plate. I was excited by the prospect of the Kreuzspitze plates, but the rails look to be too narrow. Have you seen any plates that would work? My hope is to be able to use inserts and swap between the race heel and the speed turn heel. Hi wag, I'm not aware of any plate that will adapt Dynafit touring heel holes to a ZR heel, sorry. I have Speed Turn 2 heals, I like the heals but need them to be more adjustable to accommodate different boots. My TLT5 are 317mm boot sole length and my Dalbello Ludo Ti are 337. Which binding plate should I use to accommodate both boots with the same heels? Hi Chris, with careful mounting, you should be able to handle a 20mm range with the stock Speed Turn 2.0 heels. You mention combining the Kreuzspitze 14mm working well with Plum Race Heels and Dynafit Touring Heels. Any opinion on how that half cm would factor into using the above combo but with Plum Guide Heels? I have used Plum Guides heels in drilled for Dynafit Verticals with great success. I also use a vertical era Dynafit ig for mounting Plum Guides. Granted I'm not using inserts so I imagine I have a lttle bit more fudge room, or have just been getting by on luck. Could I get away with mounting inserts for a Kreuzspitze 14mm and comboing with a Plum Guide? Hi Jasper, that should work. Haven't tried that particular swap with inserts, but the Guide and Radical pattern are very close. What are the options for a speed radical toe? Hi Phil, you can either do a B&D Toe shift plate or an Aski adjustment plate. Hi!! I need an adjustable plate for a Dynafit TLT Expedition binding. ¿Is it possible to find here? I live in Spain, and here is imposible to find it... I don´t know if you can send to me. Thank you very much!! Hi Ignacio, the basic Hagan plate works with that heel piece. There are some shipping options for you at checkout. 1) have inserts and one adjustment plate (thereby decreasing the amount of use of the nuts on the adjustment plate - although one would still have to do some adjusting each time). 2) have 2 adjustment plates - each one mounted to a ski - and move the binding back and forth? Is one more typically done than the other? Is there a good reason for one to be preferable? (I'm wondering about eventual stripping of the nuts on the adjustment plates vs dealing with loctite on the bolts in the inserts somewhat regularly... tradeoffs). Hi Phil, neither are terribly popular options, one binding per ski is still the norm. Note it's unlikely with inserts that you'd have exactly the same heel spacing across skis so you'd still be working with the adjustment bolts. We sell replacements for just about every model in case of strippage. What is the best sequence to adjust a binding on a tension plate (in my case a Kreuzspitze plate)? Do you have a recommended procedure? Hi Joe, depending on the binding you can often lightly tighten the bolts with the driver at an angle while the pins are inserted into the boot at the proper distance. You need just enough tension to not have the binding slide when you take the boot out and rotate the heel to really get at the screw heads to tighten fully. This can be frustrating though so you may want to mark the binding position with tape and then not worry about it sliding since you can line it back up with the tape. I had a look to your « Adjustment Plates » which may fix my problem. Which plates do you recommand for my G3 Ion 12 LT bindings ? Are there Front and Rear plates or just rear ? Ps: are your delivering to France btw ? Could you please tell me which plates model is working with Dynafit Tour Tech Lite? The length adjustment are only 6 mm and my Boots are 320 mm one pair and 307 second one :(. Do you ship to Romania as well? Hi Rares, you will need the B&D Shift plates to move that binding. No problem sending them your way.